ABOVE: The Stiftsbibliothek at the former St Gallen Abbey. Sankt Gallen is the most important city of Eastern Switzerland, with a trading area that extends from Lake Constance (Bodensee) on the north to the S�ntis Alps region. The city was founded in 612 A.D., when the Irish monk Gallus and a companion built a hut (reportedly with the help of a bear) in the forests of the Steinbach Valley. The hut evolved into a Benedictine monastery that became one of the great intellectual centers of Europe during the 8th and 9th Centuries. A town was founded around the abbey, and eventually the town--named St. Gallen, after the abbey's founding monk--grew into a major producer of linen and embroidered cotton fabric. The city of St. Gallen remains Switzerland's textile center, and you can shop for quality embroidered goods at a handful of Broderie shops: most notably Saphir and Sturzenegger, both of which are retail outlets of local factories. The abbey was secularized in 1805, nearly 300 years after the Reformation drove the Catholic Church from this part of Switzerland. The old monastery buildings now serve various civic functions, but the most important of them--the Stiftsbibliothek, or Abbey Library--continues to attract scholars with its 100,000 volumes and nearly 2,000 illuminated manuscripts from the Middle Ages. 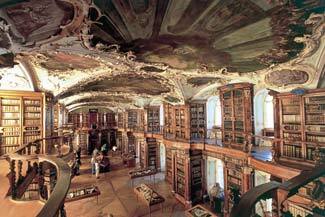 The library is also St. Gallen's premiere tourist attraction, and every year thousands of visitors don felt slippers and shuffle around the 18th Century library with its inlaid flooring, Rococo decorations, and display cases filled with ancient books. ABOVE: Half-timbered buildings in the Old Town. St. Gallen's other major tourist draws are the Cathedral (next door to the abbey) and the adjacent Old Town, where many of the well-preserved buildings feature the city's distinctive carved oriel windows. It also has museums, concert halls, a university, and a surprising range of other cultural attractions for a city of only 70,000 people. Be sure to visit the new Bleicheli "Stadtlounge" just outside the Old Town, where the streets are bright red and overhead lights resemble objects from outer space. If you're touring Eastern Switzerland, St. Gallen offers easy access to Lake Constance, Appenzell, and Mt. S�ntis. And if you're looking for a pleasant way to spend a morning or afternoon, go hiking or biking on the well-marked paved paths just beyond the town's outskirts. The surrounding region is one of Switzerland's prettiest, with its green hills, dairy farms, and traditional villages that can be reached by winding country roads or the cogwheel trains of several local railroad lines. 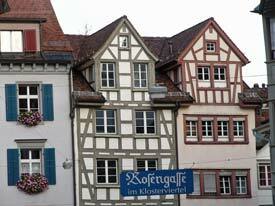 By train, St. Gallen is about an hour from Z�rich Hauptbahnhof or Z�rich Airport via Wil and Winterthur. See the Swiss Federal Railways journey planner for train schedules. By road, the easiest way to reach St. Gallen from Z�rich is to head toward Winterthur, then take the E60 east. If you have time, it can be pleasant to cruise on a lake steamer from Z�rich to Rapperswil (a two-hour trip), then ride the train to St.Gallen by way of Uznach, Wattwil, and Herisau. The train journey takes less than an hour and offers a chance to see countryside that isn't on the usual tourist itineraries. Plan your trip at the official Sankt Gallen and Lake Constance tourism site. ABOVE: The Einstein Hotel occupies a former textile factory on the edge of the Old Town. Europe's no. 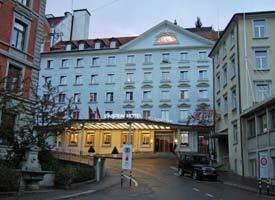 1 secure reservations service offers guaranteed lowest available rates at two dozen hotels in St. Gallen. St. Gallen's reigning traditional hotel occupies a renovated embroidery factory in St. Gallen's Old Town. Personally recommended. This June pop-music festival has been a St. Gallen tradition since 1977. St. Gallen plays host to agricultural fairs, trade shows, conventions, and recreational shows throughout the year. A calendar lists this year's events. St. Gallen's Textile Museum was founded in 1886. It features a permanent exhibition of Swiss embroidery, special exhibits, and a library of textile samples, fashion drawings, and photographs. The Botanical Garden has some 8,000 plants outdoors or under glass. In German. Visit the Museum of History and Ethnology for its 16th to 18th Century period rooms. Other exhibits range from material culture in Eastern Switzerland to objects from ancient Egypt, Africa, Asia, and Latin America. In German. St. Gallen's Art Museum opened in 1877. Its collection ranges from Dutch and Flemish masters to contemporary works. View primitive and outsider art at the Lagerhaus Museum, whose exhibits are drawn from a collection of nearly 3,000 works by 150+ artists. The Natural History Museum has general displays plus exhibits about St. Gallen, including a diorama of the area as it existed 20 million years ago. The New Art Hall is a gallery with rotating shows of modern artists. The Symphony Orchestra of St. Gallen dates back to 1877. It performs in the Tonhalle, an historic concert hall near the Old Town. Enjoy an authentic abbey dessert in the privacy of your own home. Photos 1 and 2 copyright © St-Gallen Bodensee Tourismus.